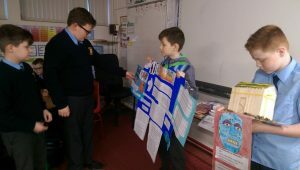 We have been learning all about the Aztecs in fifth class. The children have been busy working on their projects over the last few weeks. Such a great effort and amazing results. Well done! Bouncy castle, penalty shoot out, karate and cricket! We had drumming with Dave, tug of war, GAA skills, soccar, and art with Jarla! We began researching various topics and personalities related to Northern Ireland. We are looking at the fight for civil rights as well as the troubles and the peace process and Good Friday Agreement. While the boys were away today, the girls drew themselves in a new way! We researched various countries in Africa on the tablets and wrote up our findings. We also created art inspired by African Ndebele art. A big thank you to all that helped with projrcts, arts and crafts! What an amazing variety and effort! The whole school enjoyed the presentation today! We began making dream catchers using CDs and a weaving method with wool. Mr McGowan read to the class today. His book of choice, The Demon Headmaster!! We began book week by listening to exerpts from various books read by famous faces. We designed and drew our own book covers and enjoyed DEAR time at 12.00! Best of all, only reading homework!!!! We also took part in paired reading with 1st class! We finished our second term with an assembly based in Japan where we conveyed all that we learned over the past two weeks. We also completed beautiful art yesterday….the colourful cherry blossom branches! We completed our half day in egggggcellent style….our guggy hunt!!! We’ve begun learning about Japan. We conducted research in our tablrts. We enjoyed PE this morning in the fog! Our hurling skills are really coming along! We’ve been enjoying watching videos about feats of engineering, learning about how things work and why they are built a certain way as well as conducting experiments!